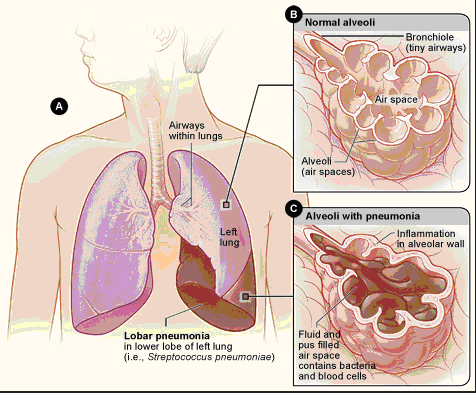 Pneumonia is inflammation (swelling) of the tissue in one or both of your lungs. It is usually caused by an infection by bacteria, viruses, or fungi. At the end of the breathing tubes in your lungs are clusters of tiny air sacs. If you have pneumonia, these tiny sacs become inflamed and fill up with fluid. 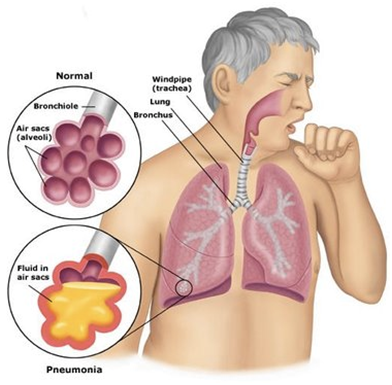 The most common cause of pneumonia is a pneumococcal infection caused by bacteria called Streptococcus pneumonia. Mild pneumonia can usually be treated at home with antibiotics, rest and fluids. People who are otherwise healthy will normally recover well. For people with other health conditions, pneumonia can be severe and may need to be treated in hospital. Good hygiene and a healthy lifestyle can help prevent pneumonia. Try to avoid smoking, as it damages your lungs and increases the chance of infection. People at high risk of pneumonia should also be offered the pneumonia jab and the flu jab. Cough - This can be dry, or may produce phlegm (thick mucus) that is yellow, green, brownish or blood-stained. Drink plenty of fluids to avoid dehydration and get plenty of rest to help your body recover. On an average 8 to 10 glasses(200ml each) of water should be consumed per day. If you smoke, it is more important than ever to stop as smoking damages your lungs. Avoid taking cough depressants on your own as it may aggravate the disease.A warm drink of honey and lemon can help relieve the discomfort caused by coughing. Complications of pneumonia are more common in older people, young children and people with existing health conditions such as diabetes. Contact your doctor at the earliest if you get above symptoms. A lung abscess is a rare complication of pneumonia and mostly seen in people who have a serious, pre-existing illness or those with a history of severe alcohol misuse. A lung abscess is a pus-filled cavity that develops inside the tissue of the lungs. Coughing up unpleasant-smelling phlegm and swelling in your fingers and toes are signs of a lung abscess. It's important to finish your recommended course of antibiotics, even if you feel perfectly healthy, though, to prevent re-infection of your lungs. You may continue to cough for two to three weeks after finishing your course of antibiotics and feel tired for even longer, as your body continues to recover. RULE OUT your concern about cough if any,by consulting your doctor. Your doctor will see you again around six weeks after you started your antibiotics. Some people may be advised to have vaccinations against flu or pneumococcal infections after recovering from pneumonia. Take all medicines as your doctor prescribes. If you're using antibiotics, continue to take the medicine until it's all gone. You may start to feel better before you finish the medicine, but you should continue to take it. If you stop too soon, the pneumonia may come back. Eat a diet rich in fruits, vegetables and whole grains--at least 5 servings per day. Cook with oils that contain polyunsaturated or monounsaturated fat like olive oil or canola oil. 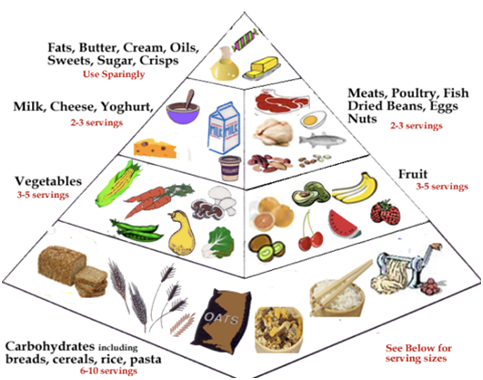 Choose chicken, fish, or beans instead of red meat. Consume white rice, white bread, potatoes, white pasta, soda, and sweets sparingly . Include dairy or calcium supplements in your diet. Limit your alcohol intake to no more than two drinks per day maximum. One serving of alcohol is equivalent to 1 ounce of liquor, 5 ounces of wine, or 12 ounces of beer. Refrain from using tobacco products, including chewing tobacco. Exercise Strive to get a minimum of 30- 45 minutes of moderate exercise most if not all days of the week. Washing hands, disposing your discharges (sputum) and keeping your dwelling airy and clean. Group support Seek such support as it gives motivation at being regular in taking medicines. It also helps to have better approach towards life with disease. Remember, an ounce of prevention is worth a pound of cure! Eat Smart. Play Hard.TM Healthy Lifestyle. Chicken vegetable soup with a pear salad. Talk to your healthcare team about the amount and types of activities that are right for you. Pick activities you like and that fit easily into your daily routine. Work out what time is best for you to exercise and stick to it. Be active with friends and family to keep you motivated. Reduce the amount of time you sit or lie down during the day. Take up running. Running is an effective and straightforward way of exercising. Get into shape with Strength and Flex, a five-week exercise plan to increase your strength and flexibility. Walk more: to school, to visit friends, to the shops, or other places in your neighborhood. For health benefits, aim to do 10,000 steps a day. A complete breath fills the lungs to capacity and helps clear secretions as you exhale. Lie on your back with one hand on your stomach just above your belly button and one hand on your chest. Inhale slowly until your lungs fill completely -- both your abdomen and chest should rise. Hold your breath for three seconds, exhale slowly until it feels as if your lungs are empty and then contract your abdomen to push out more air -- you may find yourself coughing. Repeat three to five times and pause for three seconds between breaths. 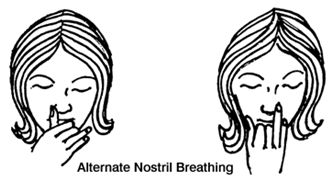 Alternate nostril breathing conditions you to breathe through each nostril. Sit in a comfortable position with the third finger of your right hand on your left nostril and your thumb on your right nostril. 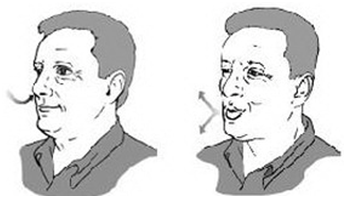 Press your thumb against the right nostril and inhale deeply through your left nostril. Fill your lungs to capacity and hold your breath for three seconds. Press your third finger against your left nostril, release your right nostril and exhale naturally. Repeat three to five times and pause for three seconds between breaths. Do not practice alternate nostril breathing if you have blocked nasal passages. Pursed lip breathing conditions your lungs by narrowing the opening through which you exhale. According to the Cleveland Clinic, this type of breathing releases trapped air in the lungs and keeps the airways open longer. Sit comfortably and inhale deeply through your nose. Let your abdomen and chest fully expand and hold your breath for up to three seconds. Purse your lips and exhale slowly, making a hissing sound. Repeat this exercise up to five times, but stop if you feel light-headed. Create a new routine where you walk or run every day when you get home from school or before dinner. If you don't want to exercise outside on your own, buddy up with a friend or use an exercise DVD in your bedroom. Dance in front of the TV or play some CDs. All you need are some great tunes and you can have fun dancing anywhere and burn calories at the same time. Do some house chores. Although light tasks such as taking out the rubbish won't raise your heart rate, some heavy gardening or washing the car will count towards your daily activity target.